Very clean example of the popular 355 Carver Motor Yacht, present owner has used the boat primarily as a condo but keeps up with the systems and mechanics. Upgrades include aft deck enclosure, interior upholstery, starboard engine risers and a recent buff and wax. 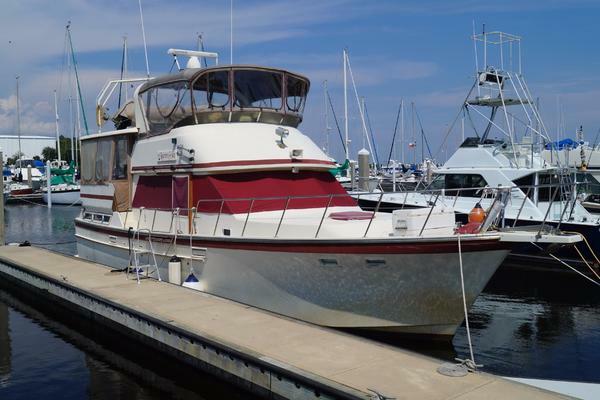 United Yacht Sales New Jersey would love to guide you through a personal showing of this 35' Carver 355 Motor Yacht 1997. This yacht for sale is located in St. Petersburg, Florida and priced at $69,900. For a showing please contact us by filling out the form on this page and we will get back to you shortly! Master cabin aft with double berth to port, generous hanging lockers, newer flat screen TV, head to starboard with Vacu-flush toilet, separate shower stall, up steps to salon L-Shaped sofa to port recently recovered with storage below, dinette down to starboard with storage converts to berth, galley opposite to port, guest stateroom forward with offset double berth, guest head to starboard. Galley down to port features Norcold upright refrigerator/freezer, coffee maker built-in, Princess 3-burner stove with oven, water heater, microwave oven, single stainless sink.